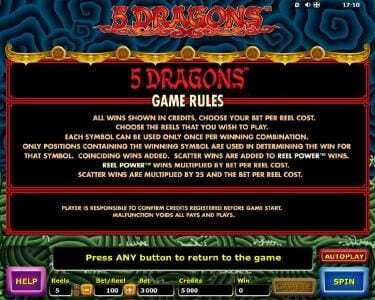 5 Dragons is a 5 reel online slot with a max payout of $3,200 using the dragons theme. 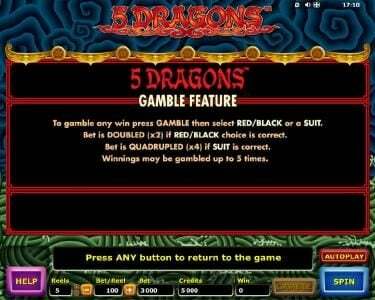 5 Dragons Slots has not been reviewed yet, be the first to rate this slot. 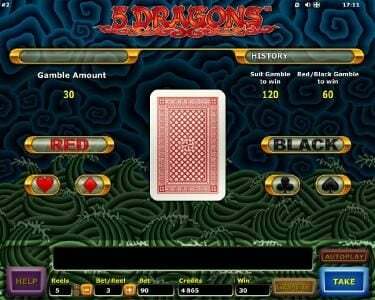 Aristocrat offers us in 5 Dragon a Slot that has 5 reels and 25 paylines. 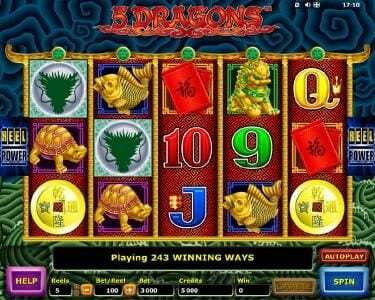 The game’s $3,200 top prize comes with wild symbols, scatters and Free Spins to help the player get as much money as possible. The game has a retro looking design, with a focus on the Chinese culture. It uses an abstract background image, which mixes blue and purple, while on the reels you will notice playing cards and Chinese inspired images. The support structure for the reels is a Chinese temple, with the classic design and the arches that we’ve come to expect when we look at one. The playing card symbols are the usual ones, starting at Ten and going up to Ace. The themed symbols include various dragons, turtles, Koi fish, tigers, coins and red envelopes. It’s not a very good design, and if you’re looking only for pretty Slots to play on, you might want to skip this one. Each payline may get only one coin when wagers are placed, with a value which starts at $0.01 and goes up to $4. The maximum bet will use 25 coins, with a value of up to $100, plus 5 coins which form the ante bet, so the maximum value is $120 for 30 coins. The player has to use all the coins, but he can reduce their value as much as he wants to. The top jackpot of the game is 800 coins, paying up to $3,200. We’ve mentioned the ante bet already, an additional 5 coins which will give the player bigger payouts, and will also give him an extra 5 spins for free if he gets access to a Bonus round. The other coins will give the player access not only to the paylines, but to 243 ways to win as well. A wild symbol, the green dragon, has been made available to the players, and it gives them extra chances of making a winning combination. They will only be available for the three reels from the middle though. The wild gains some extra powers, in the form of a 2x multiplier, if it appears while the free spins are used. 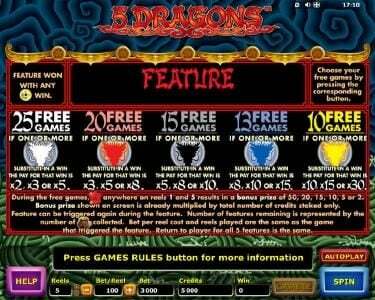 If you get three symbols with a dragon on the first three reels, a bonus round is activated, and it gives the player free spins. With the ante bet activated, the number of spins is bigger. 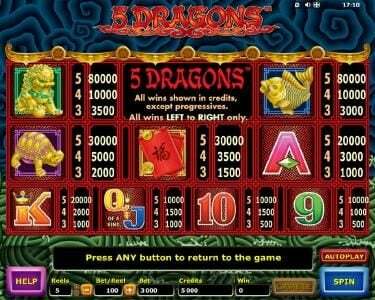 The player gets to choose between various numbers of free spins, with different multipliers for each one. 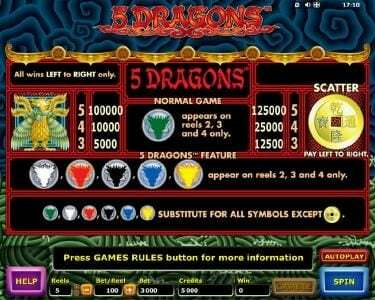 5 Dragon is a good game as far as the features included in it are concerned, but the graphics are a bit of a let down.